Have a great weekend everyone! Stay tuned for a lot more August kit inspiration! 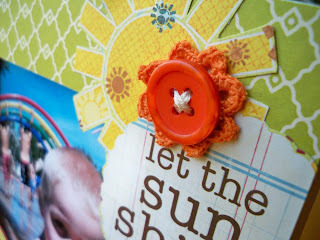 The Scrapbook Circle DT has begun to share with you our pages and projects using the August kit. And wow… what a bright, fun and summery kit it is! I wanted to share with you this altered frame I made using the kit. I picked up one of the $1 wooden frames from Michael’s and the rest is all from the August kit. Oh, except the lettering, those are Glitz alphas that were in a previous Scrapbook Circle kit. I used a simple craft glue stick and covered the front of the wood frame. Using an X-acto knife and nail file, I trimmed and buffed the rough edges. Some fussy cutting from the Fancy Pants papers… and vióla… a beautiful, custom-made frame. What a great gift to give this summer! You can check out more of the design team creations here! I wanted to talk about the fun number pattern paper included in the kit. It’s by Glitz and just FUN to look at! It took me a while to figure out how exactly I wanted to use it. Then I thought I need to trim off the stars and use them as an accent. Perfect! I used the other part of the paper to layer–Love it! For an added bonus I wanted to talk about the tiled letters that are included in the kit. I wanted to give them a boost so I topped them with crackle accents glue (from my stash). It gives it a unique look and feel. Ranger has several different types of glues that give unique looks to your projects. I have personally worked with glossy accents, matte accents & of course crackle accents. One more cool thing about these products they can also be used as a glue. I have most of the August kit spread out all over our kitchen table and am excited to take pictures of the layouts I’ve done for the reveal soon… But, first I want to just say how versatile the July kit is. I was able to get so many different looks and feels out of this kit. It wasn’t all 4th of July, it wasn’t all earth colors. It was some of everything. The scrabble tile letters were my absolute favorite part of the kit. Here are a few of my layouts that I thought captured the variety of the kit. So, thanks Lisa for designing a great all-around kit. I noticed there were still a few available, so… get one now, while you still can! Only 2 more days until the full August kit reveal! 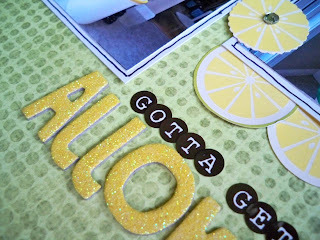 Here’s a look at another layout created with with August kit. The kit is filled with brightly colored paper and embellishments. It even includes custom crochet flowers made just for us. Can’t wait to share the rest of the kit with you! When we planned this kit we knew we wanted to include a bright yellow alpha in this kit. It seems like we usually use a more neutral colored alpha, but we wanted something really fun and bright for this kit. I love the punch of color the yellow alpha adds to the layout. Everything on this layout is from the upcoming August kit except for the lined background paper. It’s that time again! 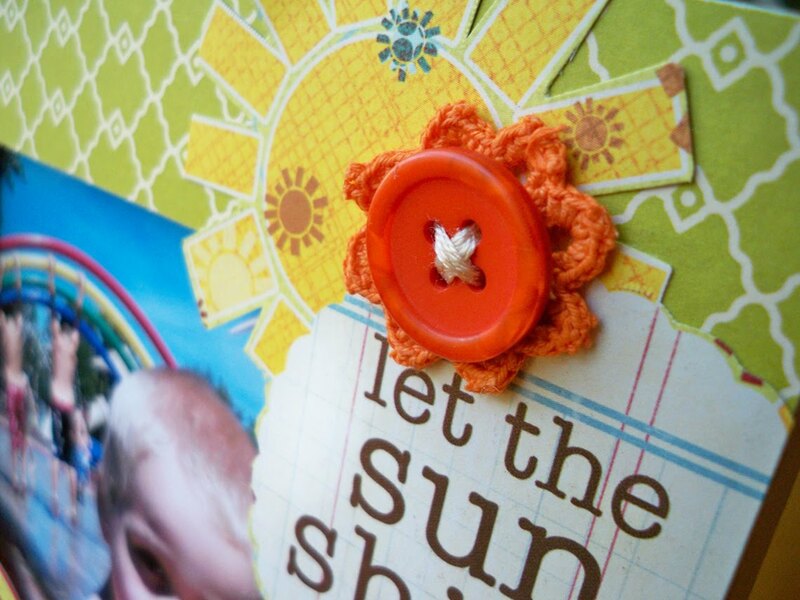 By the beginning of next week, We’ll be revealing our Scrapbook Circle August kit pages. In case you can’t tell by these sneaks, this kit is so perfect for all of the summer pictures you’ve been taking—lots of yellows and reds to make your blue skies pop off the page! To make it so that they didn’t stick to the layout I backed them on some scraps from the kit–I then trimmed the paper right up next to the scallop of the banner. Then I used my paper piercer and poked holes at the corners to string my baker’s string through (I used a needle to do that…it was a little tricky!) To mount the title to the layout I measured the distance of the title, poked holes for the brads to be place then placed the string in between the prongs of the brads and mounted it to the page. Voila! Thanks for stopping by SBC–stay tuned for some GREAT posts! I used our upcoming August kit for a layout celebrating my 5 year old daughter learning to ride her bike without training wheels. This kit is packed with a great combo of paper and I decided to let the paper and photos shine on this layout. There are a couple of different sticker sheets in the kit (one from October Afternoon and one from Basic Grey) and they make it easy to add finishing touches to pages. Everything on this layout is from our upcomping August kit except for the mini Cosmo Cricket alpha. Here’s another peek photo of the August kit. Hope you are looking forward to this kit! The Fourth of July is one of my favorite holidays. I love the parades, BBQs, time to reflect on my country. Plus it’s low stress since there are not gifts to buy, costumes to make or big parties to plan. This year our three kids were in a neighborhood parade. I pulled three of my favorite parade photos and put this layout together. 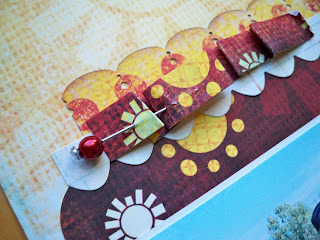 The paper, journaling card and banner stickers are all from our Jenni Bowlin Play Date kit. I have really loved the versatility of this kit. So far I’ve made a layout about strawberry jam, a day at the beach and now a layout about the Fourth of July. Update on July kits: All of the kits ordered as of July 15th have shipped. For some of the kits we had to do a swap of the Pink Paislee sticker sheet for both a Glitz Kismet sheet and Fancy Pants My Family sticker sheet. Hope you are enjoying your July kits!